On May 18, 1880 Barney Enright was born the fourth of eleven children to Patrick and Anna Enright in Janesville, Minnesota. 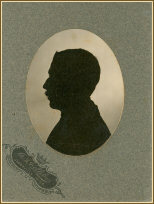 Our first glimpse of him is in this silhouette portrait taken in Janesville. At the age of 21 he moved with his parents, brothers and sisters to Lahoma, OT. It is in Lahoma that we first see Barney's fascination with photography through his exaggeration and stereoscopic photographs. During their time in Lahoma, we also see family photographs, postcards, and group photographs that bear his name. It is not known whether he had an actual studio in Lahoma, but we do find Barney's photographer's ensignia stamped on the cardboard studio frames of some photographs. The March 12, 1909 issue of "The Lahoma Sun" says that Barney Enright has a new postcard out,"Lahoma Under Snow, March 9, 1909." The tone of the article indicates that Barney's photography work was well known in the community. About 1910 the Enright family pulled up stakes and moved to Perry. On close observation of this photograph taken at Bear Creek near Perry by Barney in 1910, we see that the wagons are loaded with household goods. It is assumed that this is a photograph of the Enright family's move to Perry. They established their home on a farm northwest of town. Barney took photographs of their new home (shown at the left), farm scenes, and a few pictures for others. However, it was one of Perry's most disasterous events that caused Barney to pick up his camera and begin taking lots of pictures of Perry. On the evening of April 20th, 1912 a tornado ripped through Perry. It left two dead, caused half-million dollars of damage and widespread destruction. Outside of one picture of the demolished Blaine school, Barney's photographs are the only images to remind us of the devastation of that day. On November 21, 1912 Barney and one of his brothers opened the "Enright Bros." studio at 407 7th street in Perry. This advertisement appears in the the Perry Republican, "We desire to announce to the people of Perry and vicinity that we have bought out the photographer gallery of A. 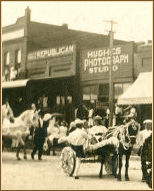 A. Hughes on 7th Street and are prepared to do first class photograph work at the same old stand." Unfortunately, the name printed on the advertisement was "English Bros" instead of "Enright Bros." However, the same day another advertisement appeared in the Perry Enterprise Times with the correct information. Barney and his brother, Walter, appear to be fun loving bachelors. In a Lahoma newspaper dated July 4, 1913 this article appears. "Barney and Walter Enright paid this office calls last Friday and Saturday. The boys came over from Perry on their motorcycles Friday afternoon and stayed all night with their uncle, Ben Schlosser. Barney is running a photo gallery in Perry and reports that business is brisk." The Enright Bros gallery was sold around the end of 1913. In 1916 Barney became affiliated with Nelson's Pharmacy on the south side of the square. He did Kodak photo finishing work for the pharmacy and set up a studio in the balcony at the back of the store. The stamp on the left is commonly seen on photographs processed by Barney. While working primarily for Nelson's South Side Pharmacy, an advertisement in the Perry Republican of April 22, 1920 indicates that Barney also did photo finishing for the Corner Drug Store at the N.E. corner of the square. The advertisement reads, "Kodak Finishing by B. P. Enright Commercial Photographer "You all Know Barney." The advertisement at the right appears in the school newspaper "The Perryscope." The date of this paper is unknown, however the school newspaper was not named "The Perryscope" until 1926. Another ad placed in the school newspaper publicly states Barney's displeasure at not being selected as photographer to take the school pictures for the year. It is titled "Likes and Dislikes." "There are two studios in Perry equipped to make anything in the picture line, movie and airplane photographs included. For three years I have made school pictures at cost and one year even failed to get the cost. I advertise in the Perryscope, the high school paper. Why does Prof. Chambers have outsiders do school work in this line? Frankly, I do not like it." Although Barney was unhappy about the school contract, he had much bigger "fish to fry." He became the personal photographer of Pawnee Bill and took many pictures of Pawnee Bill's Old Town. After their marriage Barney and Sylvia returned to Perry where they continued their work in the Enright Studio. 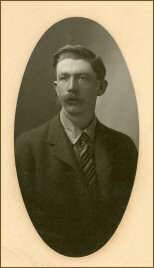 A year later, on December 7, 1933, Barney's father, Patrick Morgan Enright passed away. Patrick and Anna had moved from the farm into Perry in 1920. After his father's death Barney and Sylvia moved into the family home at 1010 Elm to care for his mother, Anna. Sylvia not only helped in the studio, she was a professional photographer in her own right. 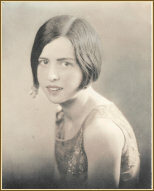 We see this 1936 studio photograph of Pawnee Bill with "Mrs. Sylvia Enright, Perry, Okla." copyright stamp on the back. On April 10, 1940 Barney and Sylvia were blessed with a daughter. They named her Judith Ann. Only a little more than a year later on May 9, 1941 Barney suffered a heart attack at his home and died. He is buried at Grace Hill cemetery. According to Sylvia's account in History of Noble County Oklahoma, “ I took over the Studio and operated it all through the War. In 1947, I closed the Studio, and went to work for Hal Owen in Oklahoma City. Later on, I met Donald H. Hooper and we were married in 1951. We moved to California, and some years later, moved to Rochester, New York, where he worked for Kodak for a number of years. Then we went to Rhode Island, where he taught in a School of Photography for ten years, and then we came here to Chittenango, to be near Judy.” Sylvia lived to the age of 95 and died in New York, March 7, 2004. Her body was brought back to Perry for interment at Grace Hill cemetery. In memory of B. P. Enright, his wife, Sylvia, and daughter, Judith, we present this collection of his photographs. * This story is told by Barney and Sylvia's daughter, Judith (Enright) Beals.